A collapsing pound, spiralling oil prices, near-rationing of electricity… over the past half-century, Britain’s economy has lurched from one crisis to another, though it somehow always survives – or at least it has done until now. Veteran financial journalist William Keegan has seen it all, from the 1967 devaluation to the three-day week, from Black Wednesday to the global financial crash of 2007–08. In a career that has seen him hop from Fleet Street to the Old Lady of Threadneedle Street and back again, he has nurtured connections with Chancellors of the Exchequer, Governors of the Bank of England, influential economists and Fleet Street legends. Now, in this lively and wide-ranging account, he takes us on a tumultuous journey through the past fifty years of our economic history – and looks ahead to explain why Brexit poses the biggest existential threat the British economy has yet faced. 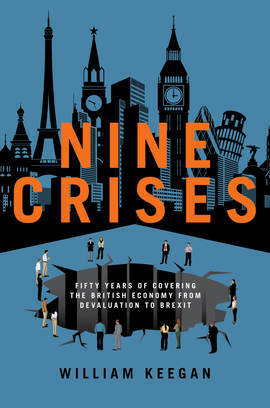 Peppered with anecdotes and memories from the author’s illustrious career, Nine Crises offers a fresh insight into Britain’s past, present and future for economic expert and novice alike. “William Keegan shows yet again why for decades his economic commentaries and insights have been essential and brilliant reading." “Nobody distils the frenzy of British economic policy-making better than Bill Keegan. He has an anthropologist’s eye for when the people, the institutions and the events collide. He writes with the thrill of the chase always in his pen."